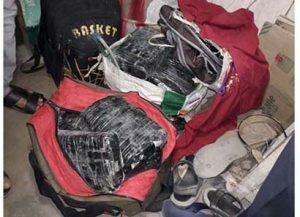 Dhubri police on Sunday arrested two ganja smugglers and seized about 20 kg of ganja from their possession. 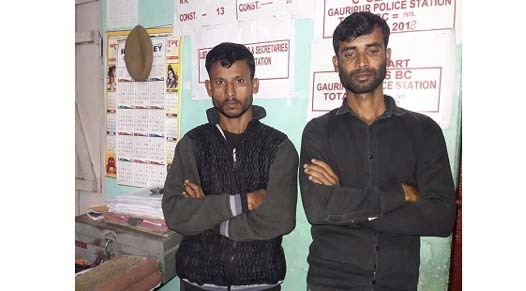 The arrested persons have been identified as Amir Ali and Mantoj Ali, both hail from Rangiya under Kamrup (Rural) in Assam. The ganja racket was busted during a checking conducted by police in a bus near Gauripur town of Dhubri district on National Highway 31. The bus was coming from Udalguri district of Assam and was going towards Cooch Behar of West Bengal. Police sources revealed that they had a tip-off about the racket from a local celebrity, based on which they launched the operation. During interrogations, it has been reported, the duo has revealed their involvement in the ganja smuggling for the past many years and has been transporting ganja consignments through bus and other modes of road transport. It may be mentioned that the Guwahati Zonal Unit of DRI in the first week of October intercepted a Force Traveller vehicle bearing registration no TR-01 C 1243 coming from Tripura at Khanapara-Beltola road (near Health City Hospital) at around 2 pm and seized 550 kgs of ganja. The market value of the seized ganja is approximately Rs 55 lakh. The items were concealed in a secret chamber under the floor of the vehicle. Two persons namely Manik Sarkar and Goutam Debnath were apprehended. A case under the stringent provisions of NDPS Act 1985 has been registered and efforts are on to nab the mastermind who handles the drug operation. This was the fifth seizure of ganja by Guwahati Unit of DRI. The total quantity seized during the current financial year is 5264.75 kgs of a cumulative market value of Rs 5.26 Cr. Further, a total of 12 seizures of ganja were made by DRI in the entire North East during the current financial year involving a quantity of 14673.725 kgs and a cumulative market value of Rs 11.38 cr.